Taxes have a huge importance in the lives of Americans. Tax evasion is punished severely. Tax crimes, high-profile trials, convicted celebrities – are constantly talked about. The famous saying “Things as certain as death and taxes, can be more firmly believed.” – was born exactly in the USA. I do not know 100% of all the subtleties of taxes. And it is not really necessary for me, when there’re so many great guides about the tax payment. In this article I will talk about what I personally encounter. So, if I there’s something which I didn’t mention – please, do not blame me much. Basically, I will tell you about what the majority is interested in: general information about taxes in the United States. This is what I am asked about most of the time. It is something that citizens are facing every year. I’ll organize it and present it in the most efficient way. Everyone in the US must be responsible solely by themselves to file a tax return and pay taxes every year. And it is important, whether you are in the United States for over 180 days a year (which means you’re a tax resident). If you live most of the time per year in Germany, and travel to USA only for a couple of month on a business trips – you file taxes only in Germany. After all, if your country has an agreement with the US on avoidance of double taxation – even if you earned something while being in US, you still won’t have to pay any taxes there. Unfortunately, if you are a citizen of, for example, Uganda – you will have to pay taxes both in the United States (on the income received in the United States) and at home (on their entire annual income). Federal IRS (Internal Revenue Service) is responsible for all the tax matters in the US. It’s possible to find all the documents, forms and guidelines on their website. Another thing is that filing on taxes has so many details (regular citizen faces it rarely, but still could happen), that only website information itself won’t be enough, therefore, and so, there is a special profession of “tax consultants” who are experts in all the main points and subtleties of hundreds and thousands of rules and special cases. If you have a complex case – it’s time for you to come to the office of a tax consultant. If your case is easier – you can file the tax return, or (which is much easier) use the third-party sites, such as TurboTax or TaxAct. 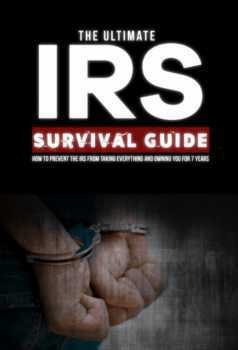 You can also download a very good book The Ultimate IRS Survival Guide. It explains the payment of taxes in the United States so easily, that even a small kid will understand! Tax return is files in the beginning of each year, starting from 1 January with a deadline until 15 April. Just select the tax form (there’re few options, depending on your case), count a bit on the calculator, complete this form, attach some documents, if necessary – and send it all to the IRS. You can print the desired form, fill it out by hand and send it by mail (and lots of people still do like this), or you can submit it in electronic form on the IRS website, or, even easier, you can use one of multiple services, such as TurboTax or TaxAct (there are many different options), whose specialists will explain you everything step by step, go with you through all the unknown questions, fill up all the necessary forms on your behalf and send it. All this they can do for a small fee ($ 10-40, of course) 🙂 Thank you!